It's not quite time to pound powder, but snow hit some ski resorts in Washington, Oregon, Idaho, Montana, British Columbia and Alberta. For many resorts, this is the first measurable snowfall of the season. The word on everyone's lips is La Niña. Temperatures in the Cascade Mountains of Washington and Oregon, the Coastal Mountains of B.C., and the high elevations of the Northern and Canadian Rockies hovered around freezing at many of the resorts the past two nights. Some resorts woke up to skiffs dropped by overnight squalls while others found several inches on the ground making the slopes look ready for the winter season. Web cams around the region lit up with teaser snows that skiers and riders hope will signal the onset of an early winter. [R493R, Whistler Blackcomb] received a few inches at the mountaintop followed by sun this morning that lit up the surrounding peaks. Crystal Mountain, Wash. received a dusting over the entire mountain with six inches of snow at the top of the Mt. Rainier Gondola. Photo by Jim Jarnigan. Courtesy of Crystal Mountain. In Washington, snow dusted most of [R124R, Crystal Mountain], but according to Spokesperson Justus Hyatt, the top of the Mt. Rainier Gondola received about six inches. [R238R, Mission Ridge] received five inches in the past two days. Several Oregon resorts found snow yesterday morning followed by more this morning. Andy Goggins from [R265R, Mt. Bachelor Resort] confirmed, "We've got about two inches at the base and four to six inches up top." The Mt. Hood resorts also received two nights of snow. Spokesperson Jon Tullis reported that [R470R, Timberline Lodge] received one inch at lodge level yesterday, which is 6,000 feet, but then last night's storm dumped five inches down to 5,000 feet. Dave Tragethon from neighboring [R274R, Mt. Hood Meadows] said that snow reached the base area while the top of the Mt. Hood Express, at 6,600 feet, got about three inches. Southern Idaho resorts picked up several inches of snow. [R087R, Brundage Mountain] reported more than four inches in the base area while [R440R, Sun Valley Resort] collected fresh snow at the 9,150-foot summit of Mt. Baldy. [R065R, Bogus Basin] also received snow as low as the base area last night. 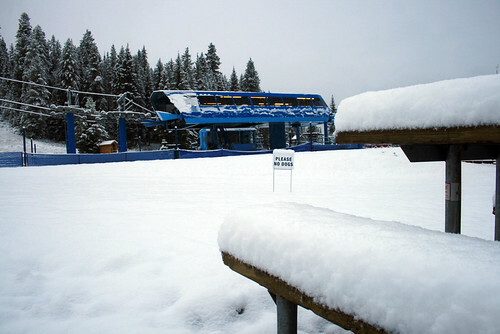 The base area at Brundage Mountain received more than four inches of snow overnight. Photo courtesy of Brundage Mountain. Web cams also showed snow overnight at the tops of resorts in the Northern and Canadian Rockies. In eastern B.C., the Eagle Eye Restaurant at the summit of [R1093R, Kicking Horse Mountain Resort] woke up blanketed with snow. Snow also fell in the upper alpine elevations of Alberta's [R368R, Lake Louise] and at the top of the Tram at [R048R, Big Sky Resort] in Montana. Wet and cooler temperatures are expected to hang on for a few more days. Check out your favorite local resort tomorrow morning. 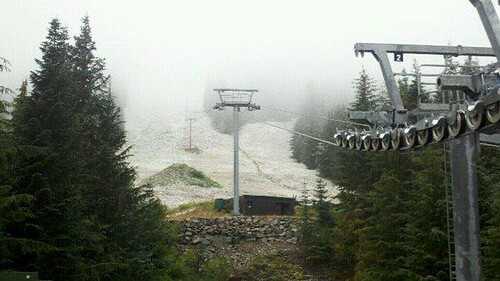 You may see new snow.